Our 10’6” iSUPs are available across a range of board types, including Allround, Allround XL and Allround / Surf. A length of 10’6” is common for inflatable paddleboards, and could be considered to be the ‘standard’ — certainly among our own selection. 10’6” Allround SUPs offer good ‘allround’ performance, bringing together the characteristic benefits of both longer and shorter boards — i.e. the speed and tracking ability of longer boards against the manoeuvrability of smaller boards —to provide a highly versatile overall design. - It opens up the possibility of a smaller adult utilising the board comfortably as they would a typical allrounder, with the added benefit of increased buoyancy for any additional load the rider may wish to carry. Most of our Surf iSUPs are 10’ in length. We do also offer a 10’6” variation, which is a good choice for taller or heavier paddleboarders, as well as an average-sized rider who wants a board with enhanced speed and tracking. The majority of inflatable SUPs sold by Two Bare Feet are 10’6” in length. Most of these models are a part of the Allround range. The Inviato Allround board is a popular entry-level model. It offers a simple, affordable construction, while still providing respectable performance. This model is a little wider than average, which helps with stability — making it easier for a beginner to maintain balance. At 4.75” thick, the Inviato Allround has a decent amount of volume; offering a good mixture of stability and buoyancy. This allows the board to cater to the broadest range of body sizes. 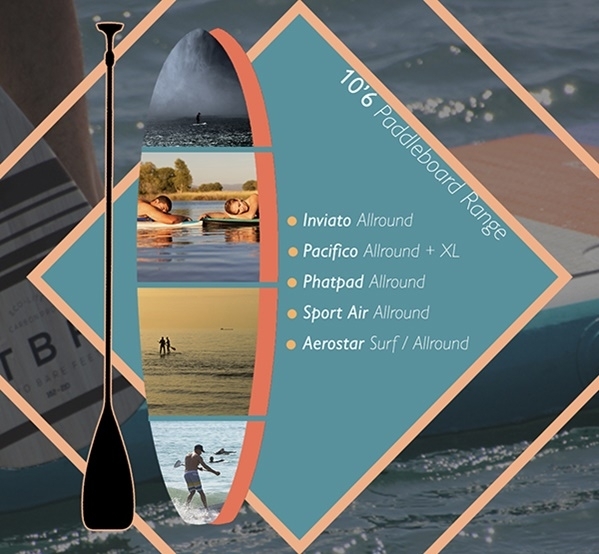 The Pacifico Allround board is slimmer than the Inviato – although at 33” wide it falls within the average breadth measurement for an inflatable stand up paddleboard. Sporting a slightly smaller board volume, the Pacifico Allround board is a good choice for the smaller paddleboarder. It’s lower centre of gravity – afforded by the 4” base – enhances stability, while the Double Wall Fusion PVC construction ensures a stronger, more rigid and more lightweight board than you might expect for the money. Unlike the Inviato and Pacifico models, the top surface of the Phatpad all-rounder features a full-coverage deck grip. As well as increasing options for foot placement, this feature also provides some protection against damage from sharp on-board objects. The bungee cord lattice to the front of the board also covers a larger surface area, meaning additional space is available for securing cargo on board. The Phatpad Allround iSUP is one of the most stable, tough and smooth-riding allround iSUPs on the market. In addition to a design that is already strong and stiff, thanks to the Double Wall Fusion laminate exterior, this model also comes with a choice of one or two air chambers. The double chamber option distributes air evenly between the individual chambers. This reduces air displacement inside the board, which could otherwise lead to the board bowing under the weight of the rider. The Sport Air allround is our premium model, offering a stable ride with decent speed and wave handling. Like the Phatpad, it features a full coverage heat-moulded EVA deck grip, double-wall fusion PVC exterior, and a choice of one or two air chambers. In addition, the feature-packed board also has a third laminate layer on its underside. The result is a supremely rigid, durable, high-performance all-rounder that will give you the confidence to go anywhere and do anything on the water. While this Pacifico model is a little shorter than most Allround XL boards, the 6” depth gives the board plenty of volume. This means it works as a high-buoyancy board for smaller riders, making it easier to paddle due to the board being seated higher on the water. The board will also comfortably accommodate a larger adult rider, providing them with additional manoeuvrability in comparison to a 10’10” Allround XL. Constructed with double wall fusion (DWF) PVC, the board is light but incredibly strong. There is extra-large bungee storage too, making it a practical choice for families with children who want to share their boards. The Aerostar Surf model provides a manoeuvrable yet stable ride, due to its lightweight construction, short design and wider 35” breadth. Constructed with a heat-laminated double wall fusion PVC exterior, the board is strong, rigid and durable. While this model shares many of the same traits as the 10’ Aerostar model, the additional 6” improves tracking and speed for average-sized riders. Larger riders will benefit from the extra support afforded by the additional length and board volume. All of the 10’6” inflatable stand up paddleboards we sell are available in a variety of colour schemes. You won’t be left short of choices; we’re certain you’ll find something that suits your personal taste. In addition, all our boards are sold with a package of accessories providing everything you’ll need to get out on the water. All packages include: a paddle, dual action pump, removable fin, drybag, coil leash and repair kit. Higher tier options also come with additional and/or up-rated accessories.